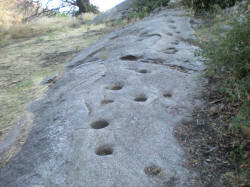 Deep, well-worn bedrock mortars and metates in Doane Valley are reminders of those many centuries when native Americans maintained seasonal villages, hunted game and gathered acorns and other seed crops here on the slopes of Palomar Mountain. The village sites and ten smaller, temporary camps or gathering stations have been identified within the present-day park. At least two separate groups of native Americans are known to have established exclusive territories on the mountain. The area around Boucher Lookout was called T’ai. Iron Springs near Bailey Lodge was called Paisvi. Other areas were known as Chakuli, Malava and Ashachakwo. These areas were used during the summer and early autumn for hunting and gathering acorns, pine seeds, elderberries and grass seeds. The main native village at the foot of the mountain was called Pauma. Sturdy conical houses known as wikiups or kecha kechumat were made of pine poles covered with bark. Semi-subterranean “sweat houses” were centrally located in the village and used for purification and curing rituals. Handcrafted products included clay jars, woven baskets, throwing sticks, nets for fishing or carrying, bows and arrows and a variety of utensils for cooking and eating. The indigenous people called this mountainous area Wavamai, but when the Spaniards arrived in the 19th century, they named it Palomar, or “place of the pigeons,” a reference to the thousands of bandtailed pigeons that nested in the area. In 1798 Mission San Luis Rey was established four miles upstream from the mouth of the San Luis Rey River, and the local native inhabitants began to be referred to as the Luiseños. Pines and firs from Palomar Mountain were used in its construction. An outpost, or assistencia, was established at Pala in 1816. Father Antonio Peyri, the Franciscan missionary at Mission San Luis Rey from 1798 to 1832, spent several weeks each year working with the tribes who lived in or near what is now Palomar Mountain State Park. He was persuasive and soon came to be greatly loved, but the mission way of life both here and elsewhere in California had some terrible effects on the Luiseños. The sudden and complete disruption of age-old living patterns, as well as the introduction of European diseases, quickly resulted in a severe decline in the population. The mission was closed down in 1834 when Governor Figueroa issued direct orders to “secularize” all of the California missions. Today many descendants of the mission period Luiseños live on nearby reservations and continue to follow the Catholic religion though they also maintain some of their earlier cultural and religious beliefs and practices. In 1846 the slopes of Palomar Mountain were included, at least theoretically, in the famous Warner Ranch. In 1851, however, the native inhabitants drove Warner off the land. For a time thereafter, cattle and horse thieves used the remote mountain meadows of Palomar to shelter their stolen animals until it was safe to take them across the border into Mexico. Nathan Harrison, a black slave who came to California during the gold rush, took up residence as a free man near the eastern edge of the present park in the 1860s. He grew hay and raised hogs in Doane Valley despite frequent trouble with bears and mountain lions. At the time of his death in 1920, he was said to be 101 years old. The old road from Pauma Valley is named in his honor. George Edwin Doane came into the area in the early 1880s and built a shake-roof log cabin in the little clearing between Upper and Lower Doane Valley in what is now the Doane Valley Campground. Doane grew hay and raised cattle and hogs on his 640 acres of meadowland, and some of the apple trees he planted survive to this day. During the southern California land boom of the 1880s and afterward, many other people also settled on Palomar Mountain. Four apple orchards within the park date from this period, as do the remains of Scott’s cabin on Thunder Ridge. Palomar Mountain State Park was created during the early 1930s, when 1,683 acres of what has been called “the most attractive part of the mountain” was acquired for state park purposes. Matching funds for this acquisition were provided by San Diego County and a group of public-spirited citizens known as the Palomar Park Association. Many of the roads, trails and picnic facilities that are in use to this day were built during the 1930s by the Civilian Conservation Corps.